Dr. Kennington is a founding member (2009) of Advanced Dental Implant Studies (ADIS). ADIS is a group of about 70 dentists from across the country dedicated to furthering clinical implant dentistry. He meets in Atlanta four times each year to present, discuss, evaluate, and develop implant treatment techniques. Our team at Cowlitz River Dental in Castle Rock, WA is always interested in providing the most up-to-date dental treatments. That’s one reason why we offer dental implants for tooth replacement. Dental implants have become THE premiere tooth replacement method over the decades, making it possible for you to have a great smile after loss of teeth has caused extensive damage. Because dental implants work much like natural teeth, they give you an improved sense of security and comfort, and they actually improve oral health too. Why choose Cowlitz River Dental for your dental implants? 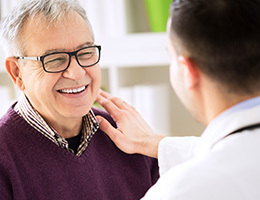 If you need a combination of oral surgery treatments to accommodate the proper placement of your dental implants, such as bone grafting, gingival reconstruction, or guided tissue regeneration, we can provide these treatments. From start to finish, your care will be provided by our talented and experienced team in Castle Rock, Washington. For patients with even extensive damage, our office offers an extremely high level of care. If you’re considering dental implants, contact Cowlitz River Dental. Why are dental implants the most successful reconstructive solution available in today’s world? Simple – they actually replicate every part of the natural tooth, including the root that exists under the gum line. Your tooth roots are providing essential stimulation to the jawbone, and this bone may gradually deteriorate over time if teeth are missing for an extended period. This is why many older patients with traditional dentures or bridges tend to develop a “hunched” facial appearance. Dental implants also provide stimulation to the jawbone and help maintain the bone and oral health while also providing a beautiful, functional replacement for the lost tooth or teeth. Once you have decided that implants are the right option for you, restoring your tooth (or teeth) will start with the surgical insertion of the implant(s) into the jawbone. Once the implant is securely in place, the natural tissue will slowly heal around it, and eventually securely bond to it. This sets the stage for a custom-made restoration that will rebuild the crown portion of the tooth. Some patients may not know that a healthy amount of jawbone structure is required to successfully replace missing teeth with dental implants. If the bone in the area has deteriorated too severely, Dr. Kennington can repair the damage with bone grafting. Our team will either take material from another part of the mouth or use tissue from a donor bank to form the graft, and this graft will encourage the development of new, healthy bone. There are multiple types of implant-retained restorations, and your eventual fit will depend on the number of natural teeth lost and any personal preferences you may have. 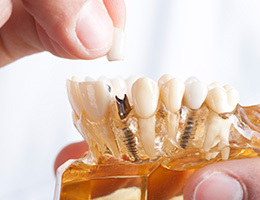 For instance, an individual tooth will be recreated with an implant-retained crown, which is custom-made and crafted from high-quality ceramic materials. This “tooth” will fit alongside natural teeth without requiring any negative alteration of the surrounding structures, resulting in a very natural look. If you’ve lost natural teeth that appear in a row, an implant-retained bridge could be the right option. This type of restoration requires two implants, which are placed on either side of the existing gap. 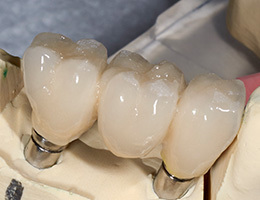 The full bridge is then held securely in place by the implants and restores the patient’s cosmetic appearance and functional bite. Overdentures – Many of our patients have worn traditional dentures for several years, and deal daily with loose-fitting teeth. A denture that is designed to snap onto implants is called an overdenture and can eliminate the loose-fit. 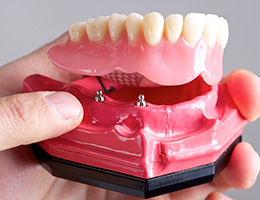 An overdenture can still be removed by the patient whenever they want. Hybrid Dentures – Hybrid dentures are securely fixed in place over the implants by Dr. Kennington. While they should be removed by our dental team at regular intervals for maintenance, patients will not be able to remove them at home. They will function very much like natural teeth.